STORRS - Among the things that the UConn women’s basketball team has been good at the past three decades is never looking past an opponent. 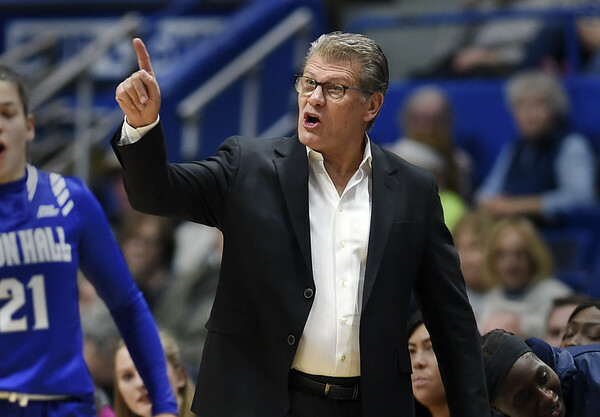 But don’t blame coach Geno Auriemma for being excited about the top-ranked Huskies’ journey west that follows Wednesday night’s game at Oklahoma. UConn wraps up its trip on Saturday against No. 14 California in Berkeley. On Friday night, Auriemma will join Golden State Warriors coach Steve Kerr on the Cal campus for “A Chat With Champions” that will be moderated by Golden Bears’ coach Lindsay Gottlieb. The fundraiser for the women’s basketball program is advertised to explore the ever-changing world of basketball, provide insights on Kerr’s and Auriemma’s success, and discuss big-picture issues affecting both sport and the world beyond the court. Kerr had a 16-year career in the NBA and was part of five championship teams - three with the Michael Jordan-led Chicago Bulls and two with the San Antonio Spurs. After retiring, he worked in television and in the front office of the Phoenix Suns. He is in his fifth season with the Warriors with three championships, including the last two, and four NBA Finals appearances. Tickets for the event are $250 per person, but Auriemma has plenty of questions for Kerr, too. Sophomore Megan Walker admitted Monday that she picked a bad time to get strep throat. Not only did she miss two games after playing so well in UConn’s win at Notre Dame on Dec. 2, it was the week before the start of fall semester final exams. Walker returned to practice Dec. 10 and got through exams. She is expected to be back in the starting lineup when the Huskies face Oklahoma Wednesday. Walker had 12 points and eight rebounds in 35 minutes in South Bend. But she started feeling under the weather the next day after the Huskies traveled to St. Louis. She was tested for strep and mononucleosis and missed the game against the Billikens on Dec. 4. Still suffering from flu-like symptoms, she took another strep test when the team returned home and it was positive, forcing her to miss the game against Seton Hall in Hartford Dec. 8. She watched the games on television. In seven games, Walker is averaging 11.6 points on 54.0 percent shooting from the floor and 5.9 rebounds in 29.7 minutes. While some are calling Saturday’s game at Cal a “homecoming” for senior Katie Lou Samuelson, remember this: Samuelson’s Huntington Beach home is a seven-hour drive from Berkeley. Meanwhile UConn’s Christyn Williams will have family and friends making a five-hour drive from Little Rock, Arkansas, to Norman for Wednesday’s game at Oklahoma. Williams will also get to see her best friend and former AAU teammate, Oklahoma freshman Madi Williams. Like Christyn, Madi Williams is off to a strong start in her college career as she is averaging a double-double (13.9 points, 10.0 rebounds) for the Sooners. She is also second on the team in blocked shots (7). UConn (9-0) remained the unanimous No. 1 in the Associated Press poll for the third straight week after having last week off. Notre Dame (9-1), Louisville (11-0), Mississippi State (10-0) and Maryland (10-0) rounded out the top five. Texas A&M re-entered the poll at No. 23 while Missouri dropped out … The Huskies’ run of three straight AAC Player of the Week winners ended Monday since they didn’t play a week ago. Cincinnati sophomore forward IImar’i Thomas was the POW while Wichita State forward Shyia Smith was the Freshman of the Week. Posted in New Britain Herald, UConn on Tuesday, 18 December 2018 21:12. Updated: Tuesday, 18 December 2018 21:15.